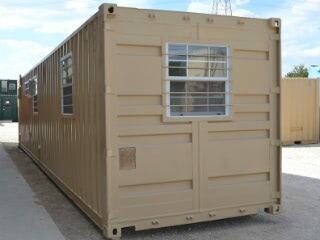 We handle all types of orders for customized/modified portable storage containers. Requests can range from simple modifications such as adding a vent or window, to more complicated work like a finished out office or army training village. I recently had a customer call in and inquire about a 40-foot portable living container with a couple of modifications. At first he wanted a roll up door and a personnel door added to the portable storage container. Then after talking a bit more he wanted the container to be insulated with an AC/Heat unit… Then windows and this continued until I found out that he was really trying to us this as a sort of Fall/Winter/Spring hunting cabin. He wanted to have the doors for a nice airflow and so that he didn’t always need to use the air conditioner. He also has small children so he needed the personnel door for them for have easy access in and out of the portable storage container. We were able to design a customized living space to meet his exact needs. There are so many options available when it comes to modifying a portable storage container. We are open to any new ideas that customers may have.